A painting by Russian born artist Erte 1892 - 1990. Roman Petrovitch Tyrtov adopted the pseudonym Erte from the French pronunciation of his name to avoid embarassing his family who wanted him to follow a naval career in the footsteps of his father, a Russian admiral. 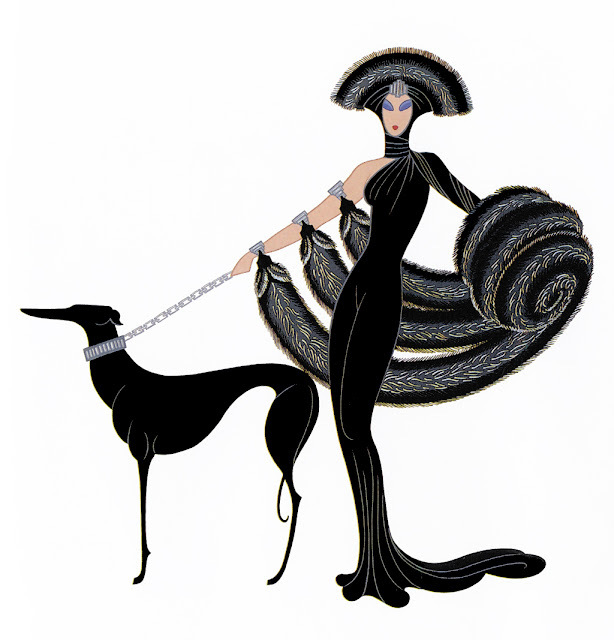 Erte had moved to Paris in 1910 where he lived with Prince Nicolas Ouroussoff. He worked as a designer and produced more than 200 covers for Harper's Bazaar as well as illustrations for Cosmopolitan, Vogue and The Illustrated London News. Working in Hollywood in 1925 he was responsible for fashion and set designs for a number of films including Ben Hur.